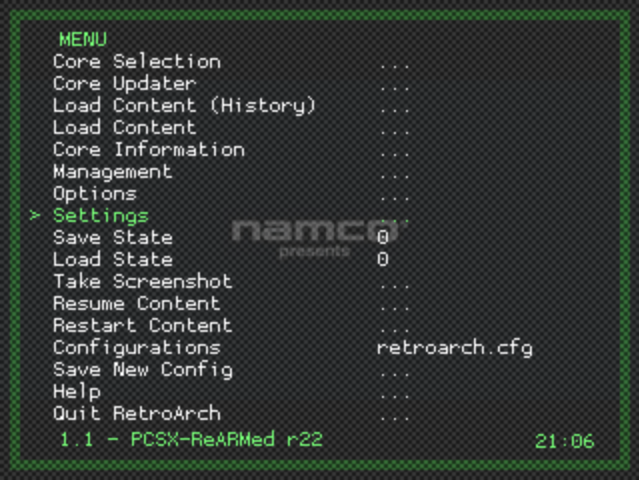 Retropie’s PCSX-ReARMed PlayStation emulator supports analogue controls, however enabling support is a little unintuitive, although not difficult. There are a few small limitations and quirks, most of which are easily circumvented, as discussed below. For the most authentic experience, a genuine PlayStation DualShock analogue controller is recommended, or a functionally equivalent device (for instance I also use a wireless Xbox 360 controller). I am also assuming the use of a USB controller adaptor, such as a Mayflash or Wise unit (see my earlier post entitled What is RetroPie? System overview, software and hardware). For analogue (and digital) controls a suitable joystick configuration file is required. Unfortunately controller setup can be nontrivial, and is beyond the scope of the current post; I am, however, planning to cover this topic in the near future. Access to the menu is, by default, via the F1 key whilst the emulator is running. From the Core Options menu, set the Pad 1 Type entry to Analog. Repeat for Pad 2 Type as required. The entry for Pad Type defaults to standard, that being a digital-only controller. The entry User 1 Device Index determines which USB controller handles input for Player 1. In the example the entry Huijia PS/NS/N64 is the internal name for the Mayflash USB adaptor. The entry for user 2 is Xbox Gamepad, as my setup also has the Xbox 360 Wireless controller drivers installed. Once the emulator has been setup for analogue input, don’t forget to ensure the controller is set to analogue mode by use of the appropriately named recessed button on the unit. Games may no longer respond to inputs, and in some cases the emulator may fail to detect the pad, even when the controllers are running in digital mode (via the function button). *The PlayStation was originally released in 1994/5 with a digital-only controller. The PlayStation Dual Analogue Controller was introduced in April 1997. This was soon superceded by the DualShock controller (SCPH-1200), released in Japan in late 1997, and elsewhere in 1998. This classic rhythm action title does not respond to most button presses when using the Xbox 360 Wireless controller (whether input is set to analogue or digital), despite this working flawlessly on all other games that I have tried. I assume that Parappa reads the controller input in a nonstandard manner which disrupts the driver handling the Xbox controller. If Pad 1 Type is set to analogue when booting the game, the emulator will crash during loading, returning the user to Emulation Station. This occurs after the Hammerhead logo screen, as the spinning Quake logo icon appears. To resolve the issue, ensure Pad 1 Type is set to standard during boot, then change to analogue once the game has loaded. Note: when in analogue mode, navigation of the RetroArch/Libretro menu is imprecise; I generally temporarily switch the controller back to digital mode using the recessed mode button (it is not necessary to alter any entries in Core Options or the Settings menu). Unfortunately there does not appear to be any support for rumble/vibration, whether using a genuine PlayStation DualShock, third-party, or otherwise rumble-equipped pad (such as the Xbox 360 Wireless unit). Thanks you for psx analogue setup – really appreciated. I have spend days trying to get my controller to work in analogue, unsuccessfully. It does work in the other emulators..
Really glad that the guide helped; the controller setup for PlayStation emulation is strange indeed! For now it seems to work only on PS3 controllers. Thanks for mentioning this; I’ve been following the developer’s efforts with interest (user alexis-puska on the RetroPie.org.uk/forum). Hopefully it’ll work on other controllers soon, including the original PlayStation DualShock.